Shravanabelagola is a Jain piligrim centre. The town of Shravanabelagola is situated between two hills known as Vindyagiri( also known as Indragiri) and Chandragiri. The star attraction at Shravanabelagola is a large monolithic statue of Lord Gomateshwara Bahubali in the Vindyagiri hill. It is approximately 17.4m high and has inscriptions on its base in Kannada, Tamil and Marathi. Every 12th year a Mahamastakabhisheka is held in which the whole statue of Lord Bahubali will be anointed with milk, ghee, gold coins etc. There are Jain Basadis on both the hills with many inscriptions dating back to 600 AD. There is a big pond between the two hills. 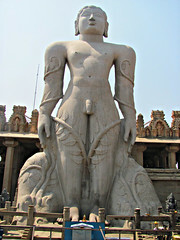 Shravanabelagola is woth visiting during the months of September to February. There are South Indian and North Indian hotels available at Shravanabelagola town. Some of them are Hotel Raghu Ph:08176-257238 Hotel Yatri Nivas Ph:08176- 257923 VIP Guest House Ph:08176- 257277 Alternate options are to stay at Channarayapatana or Hassan ( 50km ). Shravanabelagola is 160km from Bangalore. Route 1: Bangalore - Nelamangala - Solur - Kunigal - Hirisave - Shravanabelagola. KSRTC runs only few direct buses from Bangalore to Shravanabelagola. To Channarayapatana which is 11km from Shravanabelagola there are ample number of KSRTC buses available from Bangalore. From Channarayapatana there are many KSRTC buses available to Shravanabelagola.